Bright white dinner overcoats are truly attractive with regards to its design. It tasks modern design, category and innovative picture for an exclusive outcome. And this has been shown pretty well in most bond films as he is seen wearing his official white evening jacket for social activities creating an long term impact. This particular design is primarily used in dark-colored tie activities where individuals couple this white evening meal coat with dark-colored tux pants, white clothing and dark-colored tie to create that powerful official perspective. These white dinner overcoats generally come in two different styles such as individual breasted white custom overcoats and the double breasted white jackets. This style is recommended for a man who is strong with regards to his physical features to opt for the twice breasted edition as twice breasted white evening meal overcoats enhances volume built men really well. However, most men opt for the individual breasted design as it is ranked higher with regards to reputation in comparison to twice breasted design. Besides, it is considered as a more secure option to go for individual breasted design by most individuals. If you want a conventional design when it comes to these white dinner jackets, go for a coat that has backside that is vent-less. The best evening meal overcoats for evening activities comes in either night time red or white color with the latter being more popular as it offers powerful official perspective. You are certainly limited to look stylish, stylish, official, professional and unbelievable in our white evening meal coat selections. You don't even have to think twice while shopping at our site as we place a special focus upon quality of our products. However, you are going to have to be very particular and choosey when it comes to choosing the right coat to suit you well and makes you look great. 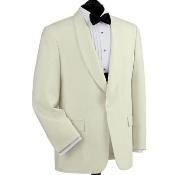 All of our white dinner overcoats are priced at reasonable rates just for your advantage and your fulfillment.